Our popular preschool-friendly clock gets a cool update! A larger face, exposed natural wood, and pops of vibrant colour on match-able chunky pieces make for a fresh modern look . . . but the classic play value and top-quality construction remains the same. 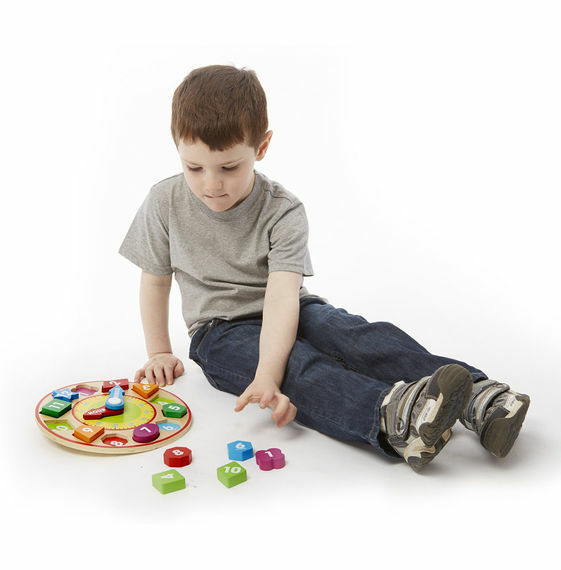 Children can match the colours, sort the shapes, and solve the puzzle as they manipulate the colour blocks and turn the hands, building cognitive and motor skills and laying the groundwork for learning to tell time. 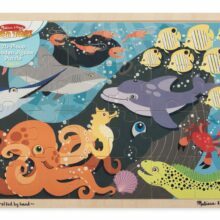 Activities printed right on the box encourage interactive play, helping children begin to master early-learning concepts as they gain familiarity with the form of a clock and concepts of time. As children sort the pieces, push the hands, and explore visual cues on the clock face, caregivers can help them understand and talk through it all. The clock can also be a unique way to talk through the events of the day, talking about what happened in the morning, at midday, and in the evening, as the clock hands move around the clock to show breakfast time, lunchtime, and bedtime. 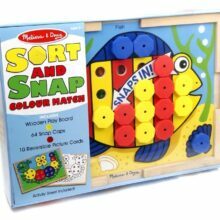 Great skill-builder for colour recognition, shape recognition, counting, and fine motor skills. Each solid-wood, removable shape piece has a distinct shape, offering a hands-on tool for learning about the different types of edges and corners that make up a geometric form. Thanks to a shape-guide on the back of the clock, caregivers can help children learn each shape name too from triangle to octagon, and even a qua-trefoil. Each also features a bright colour–and with two shapes in each shade, opens up possibilities for matching and sorting activities. The numbered shapes can be placed in sequential order, used to illustrate simple maths concepts, stacked high as a motor challenge, and of course placed in the matching wells to complete the clock face. This classic set offers countless ways to play and learn!